low calorie snacks. low calorie starters. No one would like to give up snacks and starters, even when on a weight loss regime. This section is an attempt to make the weight loss menu more interesting. With more than 100 recipes in this section, you are sure to be pleased by a few. With options like Baked Oats Puri and Buckwheat Dhoklas, Bajra Carrot and Onion Uttapa and Masala Vadai from South, Cauliflower and Oats Tikki and Healthy Moong Chaat from North along with Jowar and Til Nimki from East, this section has recipes to please people across India. Along with these also find a few more recipes like Lettuce Wraps, Masala Baked Twisters, Almond Bread, Broccoli and Paneer Satay in Red Pepper Sauce etc. to add more variety to your snacks. 1. Befriend veggies and sprouts to create your own healthy snack. 2. Not get carried away too much with the flavours of these snacks. Keep a check on your portion size. 3. Cook certain snacks like Low Fat fries absolutely occasionally. Treat yourself with it when you have achieved a particular weight loss goal. 4. Not serve these snacks with fat laden accompaniments. These Karela Muthias will surely make you a fan of karela, the addition of onions and garlic adds to its flavour. They are good for weight watchers and also diabetic friendly. Oats Methi Muthia recipe proves that you can make healthier versions of almost any dish by throwing in a few thoughtful ingredients like oats and methi in this case. Steaming ensures minimal use of oil making this a great option for weight-watchers. Dal Pandoli is a gujarati steamed snack great for weight loss loaded with nutrients like protein, fibre, vitamin A and iron. Enjoy this healthy steamed snack with Healthy Green Chutney. Be it a kid or an adult, tikkis are loved by one and all. Make your tikkis fibre rich by adding ingredients like oats and sprouts. Mixed Sprouts and Chana Dal Tikki is a great way to add fibre to your daily diet, have them with low calorie chutney or low calorie dips of your choice. Oats and Moong Dal Tikki is perfect for evening snacks to satisfy your hungry tummy as they are quite filling. Add goodness of soya and spinach to your tikkis and make Hara Bhara Soya Tikkis, it’s good for people on a weightloss diet. Moreover, the garlic in it will also help in reducing cholesterol levels. 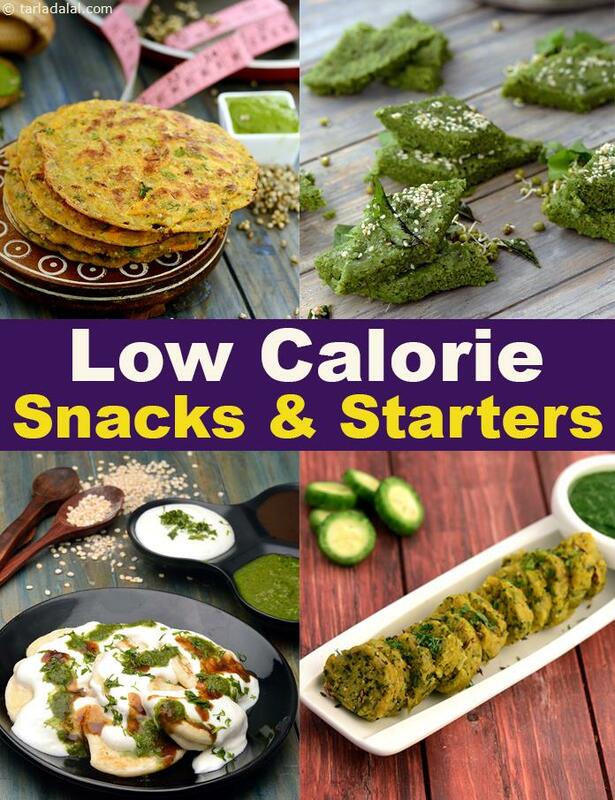 Enjoy these low calorie snacks, low calorie starters with a healthy accompaniment of your choice and the low calorier articles below. Suggested serving size for 100 calories: 4 pieces this baked and colourful, multipurpose dish is versatile enough to be a snack or starter or even a complete meal. The nutritious answer to all your dieting woes. Love your collection of Low Cal Snacks. Recommend the Sprouted Moong and Methi Chila as its healthy and made it lots of time.